Sacramento Superior Court Presiding Judge Kevin Culhane welcomes close to 100 attendees to the court's 4th Annual Court-Clergy Conference. 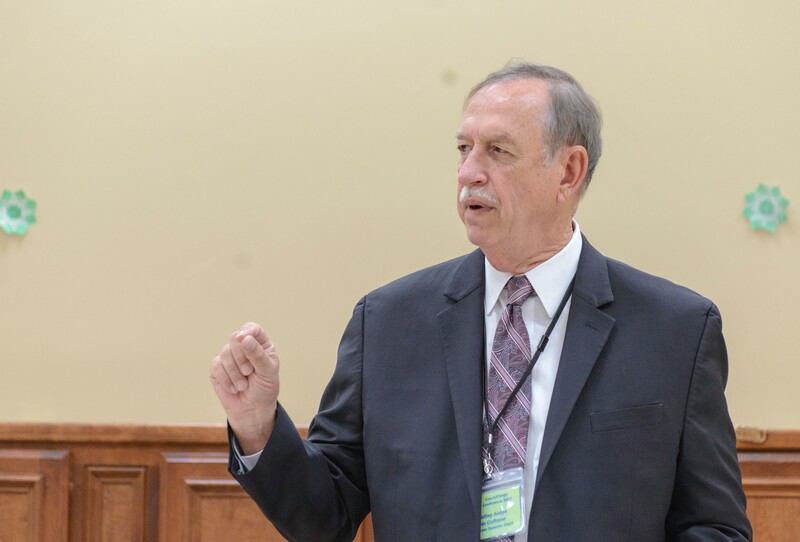 A court-clergy conference in Sacramento last month brought together trial court judges, appellate court justices, and local clergy for a day-long dialogue on issues ranging from domestic violence to immigration. Co-hosted by the Sacramento Superior Court, the 4th Annual Court-Clergy Conference took place Oct. 19 at the SALAM Islamic Center. Courts throughout the state have held similar court-clergy events as part of their ongoing community outreach efforts. In April, the San Diego Superior Court hosted its second annual conference, which included 100 religious leaders and 23 judges. “Religious leaders greatly benefit from a better understanding of the family, criminal, juvenile and civil courts so that when one of their congregants is confronted with a legal issue, such as divorce, drug abuse or immigration concerns, they can provide informed advice," said San Diego Superior Court Judge Laura Halgren. "The knowledge gained from this conference will provide clergy with confidence when assisting parishioners who are dealing with the courts.” The San Diego forum was held at the First United Methodist Church. Ninety-seven percent of attendees rated the event "very useful" or "useful" to their work as religious leaders. Other courts customize the conference to serve the needs of families in their community. In May, the San Bernardino Superior Court’s event focused on children in the court system and offered presentations on child custody, abuse, school attendance, foster care, juvenile probation, and immigration. The state's first court-clergy conference was organized in 2002 by Los Angeles Superior Court Judge Richard Fruin, Jr. Judge Fruin organized the event to open a channel of communication with religious leaders to provide them with accurate information for the people they counsel. Today, the conference is a part of the Los Angeles court's robust community and public outreach program. To learn more about court outreach for adults, visit the California Courts Outreach and Education Resources webpage. In 1999, the Judicial Council added community outreach as an official function of the courts in its standards of judicial administration.